Solution leverages real-time digital communication and data to enable hospitals and physician teams to track and guide the care of their patients that transition to post-acute care, supporting improved patient outcomes and value-based care efforts. 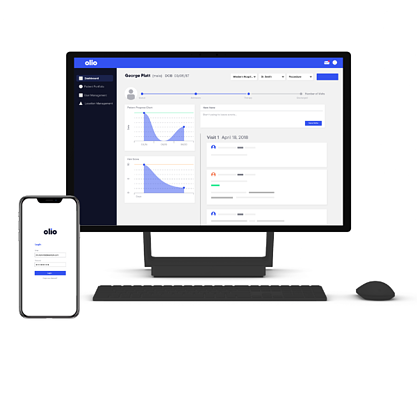 Carmel, IN – January 10, 2019 – Olio, the only communication platform that digitally connects hospital and physician teams with post-acute providers around the patient’s episode type, today announces the national launch of its technology platform. “Olio started as a consulting firm aimed at improving alignment between acute and post-acute providers,” said Ben Forrest, founder and CEO of Olio. “After saving millions and improving clinical outcomes, it was clear the market needed a lasting, scalable way to solve the communication puzzle in the episode of care.” Designed in collaboration with hundreds of healthcare providers - Olio was developed so providers could more easily manage the complex needs of their patients, thrive in value-based/ risk arrangements, and eliminate unnecessary workflows; all while communicating dynamically and securely about their patients’ condition. Digital Connectivity: Olio provides hospitals and physician teams with visibility into patient location, condition, and clinical effectiveness of their partners across the care continuum. Real-time Communication: Olio’s digital communication platform connects acute and post-acute providers, making direct, real-time communication possible. Episode Specific: Episode specific progress logs and care protocols ensure both acute and post-acute providers have the essential information to provide the best care to specific patients’ needs. Secure Platform: Olio is built on a HITRUST certified infrastructure that is both ISO 27001 certified, SOC 2 Type 2 audited, and has full HIPAA and GDPR/Privacy Shield compliance programs in place to ensure the security of protected health information. Olio has partnered with progressive Midwest providers, who are engaged in value-based arrangements including BCPI-A, ACOs, and other risk-bearing healthcare reimbursement models. In coordination with the national launch, Olio is in the process of implementation with additional health systems, physicians, and post-acute providers committed to technology enabled solutions to improve patient care and experience across the care continuum. Olio closes the communication gap between physician teams and post-acute care providers, so patients receive more coordinated care. Physicians receive immediate visibility into patient care beyond the hospital. Care coordinators gain access to specialty specific progress data on patients. Hospital systems improve financial performance as a result of increased clinical effectiveness. For more information, visit www.olio.health.